Atarimania aims to provide detailed information on all programs ever written, which means you should find nearly all "official" releases listed. Moreover, we are dedicated to preserving software in its original form whenever we can. As a result, we have decided to use simple abbreviations and color codes in the main table (which lists the records) so visitors can easily find out what the original versions of Atari 8-bit programs are meant to be, what we have and what we need. Hopefully, this will also encourage visitors to contribute so we can fill in the blanks in the collection. The ultimate goal, of course, is to archive this rare software before it is completely lost or forgotten. The way we list our records is really nothing fancy: the titles are sorted alphabetically and you'll find information on the year of release and publisher as well. Note that, although "publisher" mostly has a commercial connotation, the word also applies to a user group / group of individuals releasing a game, utility or whatever as public domain or shareware. Commercial self-edited programs with just the name of the author will often have Smith, John as publisher. A [no publisher] in the column indicates a public domain, freeware or shareware program released with just the author's name as reference. 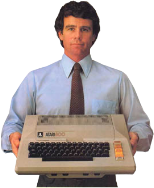 TUR is for programs originally released as Turbo BASIC files (public domain, type-ins from magazines and books...). To mark what's in the collection, in what form and what we need, three different colors are used for the above abbreviations: black, blue and red. Black is for missing items. This means that we need your help in locating a copy of the program so it can be archived. Blue is for software that we have in cracked or unverified form. For example, if we know a game was sold on tape and we only have an executable (meaning it was pirated), we will mark it as T. Same for disks that have been unprotected or need to be verified for authenticity (D) and for any type of file. Red is for original dumps only: unmodified disks (either unprotected from the start or still with copy protection), tapes, cartridges or any sort of file. K, BAS, EXE... are abbreviations you'll see. Of course, the aim of the game is to have lots of red, to get rid of programs in blue in favor of red and to avoid having anything in black! Click on the program of your choice and you'll have most of the information you'll need, sometimes with nice bonuses and hopefully with a download option. Tabs appear on top of the fields so mostly everything is self-explanatory. You shouldn't have problems if you check the additional windows on the page. - unless stated, all software programs available for download are original versions. Enjoy your stay and feel free to leave your comments!